Blockbuster Blowout! | As I blog. Last, last weekend, Dawn visited and we started watching Mad Men while making purple soup (yet another soup post coming soon). I finished up the first season two nights ago, and on a total whim, I thought I'd go see if I could rent season 2 from the Blockbuster near my house. Yes, I still do antiquated things like visit physical stores to purchase physical video rentals. The store was a wasteland of abandoned DVD piles, mostly empty shelves, and "Everything must go!" (including the furniture, shelves, and office supplies) signs -- not surprising, given the recent announcement they're closing a third of their remaining retail stores. Anyways, I thought I'd do a once around the store to see if any of the leftover DVDs were worth their $0.99 purchase price, and I hit a total jackpot! First, I found the complete season 2 and 3 of Mad Men for $4 and $5, respectively. 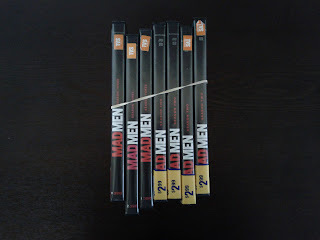 This was totally serendipitous because they only had about six popular TV DVD series to choose from, and only one set of season 2 and a handful of season 3 sets. More Don Draper and Peggy! 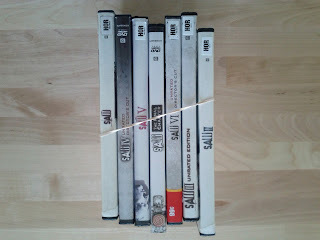 Second, I found the complete SAW series! If you know me, you know I love my psychological thrillers. While SAW probably ran a few movies past it should have, I still enjoyed and watched every movie in the series, and made the $7 purchase for sentimental value. Perhaps it will be something to pass down to the kids one day. SAW marathon material... who is in? Steve? 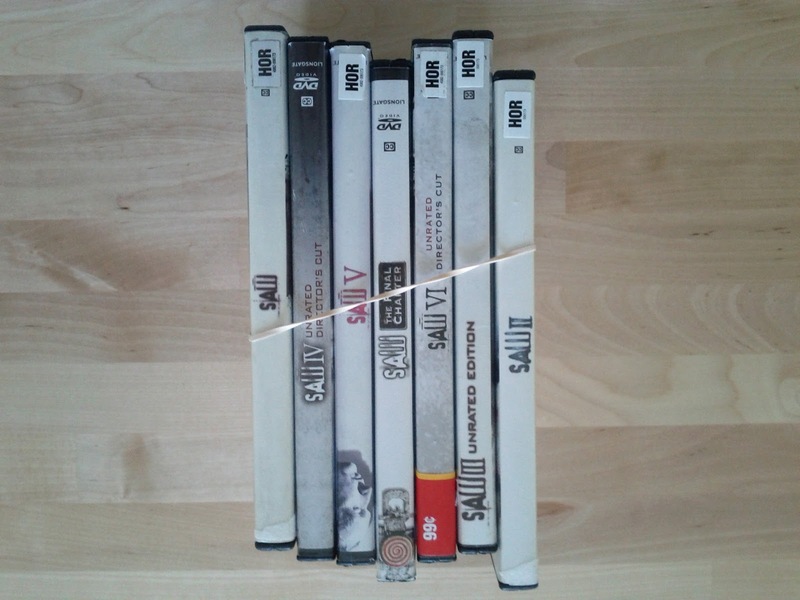 I know video rental stores are on the outs, and it makes me a bit sad. For the same reason I fear we won't have physical book stores one day, I'll miss walking into a video store with nothing specific in mind and perusing cover art and descriptions or letting a friendly clerk sway my choice. I still have fond memories of Rentertainment at UIUC, and not just because of the ultra-cheap $1.00 rental price.